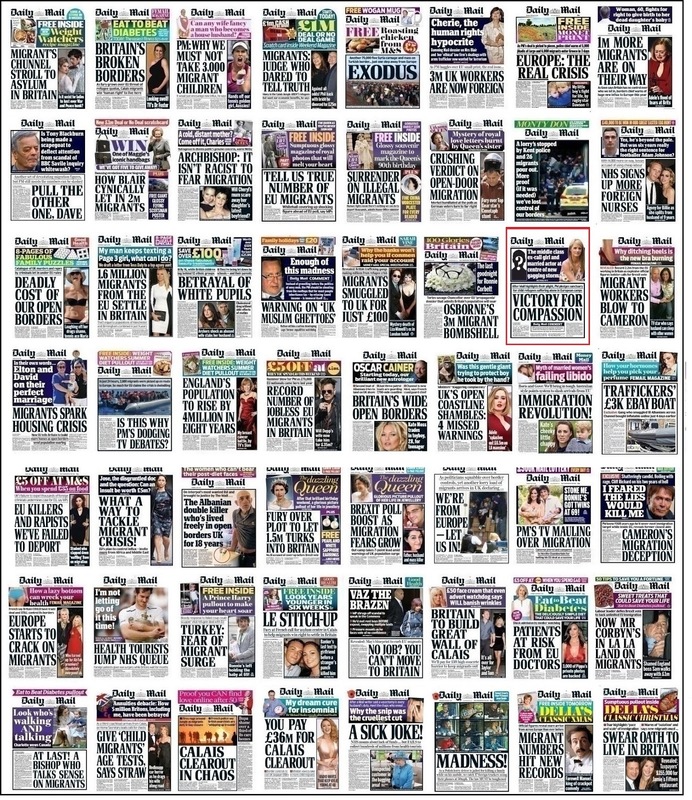 The question of foreigners - immigrants, refugees, asylum-seekers, hospital patients, murderers, rapists, mobile phone-using lorry drivers - coming to Britain is of abiding concern to the Daily Mail. It was deemed the most important issue of the day 56 times last year, accounting for 18% of the paper's lead stories. 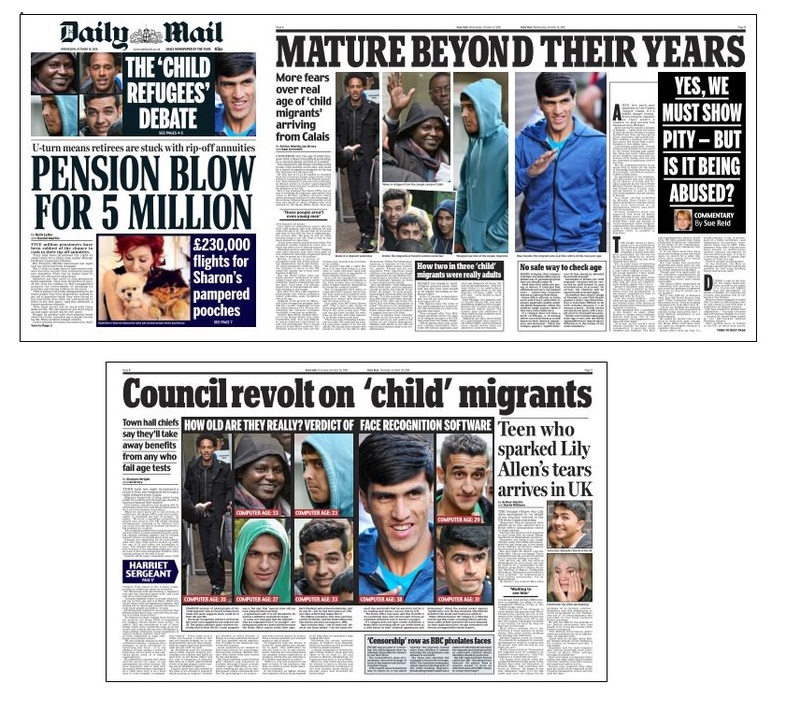 It is probably fair to say that the Mail did not regard these arrivals (or potential arrivals) as a good thing. But in the sea of hostile headings, one stood out. 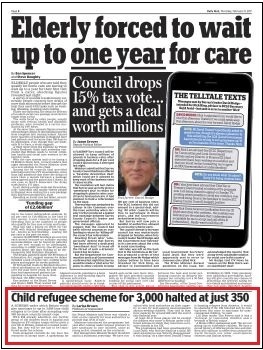 On May 5, the Mail hailed a "victory for compassion". Three thousand lone children were to be allowed into the country and to stay here for up to five years, after which their cases would be reassessed. The previous week David Cameron had reiterated his refusal to admit refugee children who had no family here, and a Commons attempt by Yvette Cooper to force his hand had failed by 18 votes. The Prime Minister had first set out his objections exactly three months before. 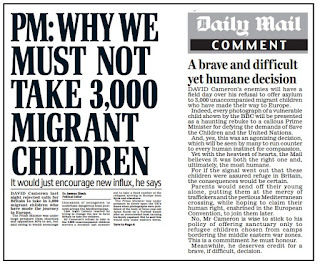 The Mail splashed on the story and ran an editorial praising his “brave and difficult and humane decision”. The leader predicted that Cameron’s enemies would have a field day, but that he was wise to stick to his existing policy. The Mail, however, turned out not have the Prime Minister’s willpower. After the narrow Commons vote, it took a deep breath and published a full-page leader. It denounced Cooper's "intemperate attack"; it attacked the paper's "sneering critics, parading their right-on consciences while enjoying the benefits of cheap nannies and plumbers"; it attacked the "bien pensant liberal elite, cocooned in their prosperous postal districts"; it attacked Angela Merkel, whose refugee policy had "left her with blood on her hands". Cameron, it said, had "nothing whatever to be ashamed of". BUT...he was wrong on this. Emphasising at every turn how the UK had "no duty to these children, however wretched or desperate they may be", the Mail decreed that he should let the children into "these overcrowded islands". While we understand the the arguments for hardening our hearts, we believe that in the exceptional circumstances of the crisis it would be wrong to do so. True, we have no legal or treaty obligation to lift a finger to help. But our moral and humanitarian duty cannot so easily be shrugged off. 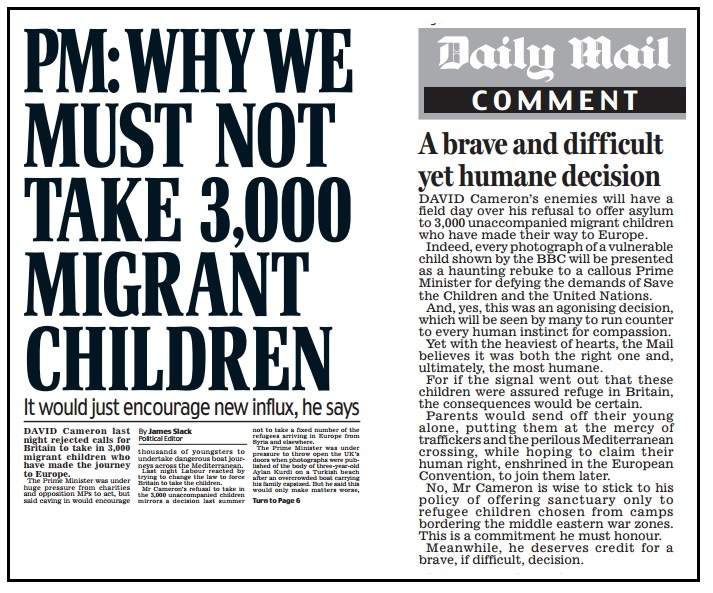 Influenced by the Mail leader - or by the prospect of a Tory rebellion (this was just six weeks before the EU referendum, on which he was already battling against half his party) - Cameron retreated and gave his backing to Lord Dubs's proposals that would allow up to 3,000 children who had already reached Europe to come to Britain. And so, on May 5, the Mail splashed on the change of heart - making quite clear in the overline and the second sentence its own importance in driving the new policy. Up to 3,000 children stuck in squalid and dangerous EU refugee camps will be given a new life in Britain. 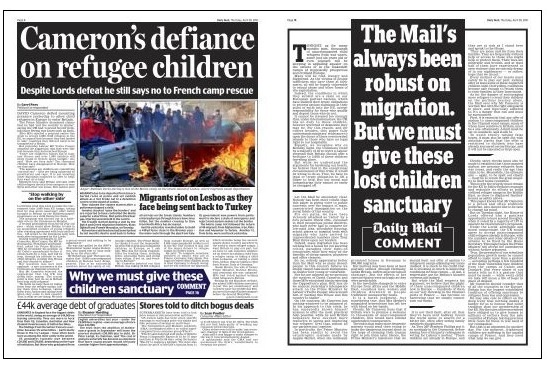 Just days after the Mail called for David Cameron to show compassion, he dropped his opposition to the offer of sanctuary yesterday. Further down the story, Liberal Democrat leader Tim Farron says: "Today's result would not have happened without the Daily Mail and its readers." A leader also played up the paper's part in the about-turn, starting: "When the Mail called on the Government...." and continuing: "Common decency demands that we help them and it was for this reason alone that we urged the Government to act." To complete the package, Robert Hardman had been despatched to Calais to tell the story of 12-year-old orphan Zyrat and why a civilised Britain should take in children like him. Details of how the scheme would work were understandably sketchy at this stage, but the suggestion was that local councils would be in charge of the practicalities and that Whitehall would pick up the bill. Some of the foreign aid budget (another of the Mail's abiding concerns) could be used for the purpose. It shouldn't be too difficult, the Mail leader said: "Given that we currently have annual net migration into Britain of 330,000, it should not be a huge burden." As it had reported the previous week, Sarah Brown had written on Mumsnet that 3,000 children amounted to just five per constituency - nowhere near the 10,000 (including Lord Dubs) that Britain had saved through Kindertransport before the Second World War. The children finally started arriving in the autumn and they turned out not to be the smudge-faced little moppets in raggedy dresses the Press had been hoping for. Some looked over 18. Rather than open our arms to them, some suggested that we open their mouths to subject them to dental tests to find out how old they really were. 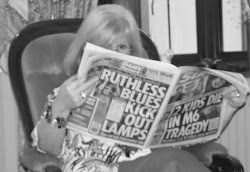 In the Mail, Sue Reid asked: "Yes, we must show pity, but is it being abused?" The next day the paper went for an approach even more scientific than dentistry: it scanned photographs of the incomers using a "fun" computer app called "How old do I look?" and concluded that one of the refugees was 38. In the scramble to get refugees out as the Calais Jungle was being dismantled, a handful of older people may well have struck lucky, but there has been no definitive reporting of the ages of the overwhelming majority of the few hundred children who finally made it here. Now the door has been shut, with the final tally of children accepted in Britain likely to be about 350 of the 3,000 who were originally promised a new start. Immigration minister Robert Goodwill announced yesterday that councils had told the Government that they could cope with only 400 children to the end of the financial year - and 50 of those were coming under a different scheme. Tim Farron, who had commended the Mail's role in securing the promise last year, described the decision as "a betrayal of vulnerable children and a betrayal of British values". "Betrayal" is one of the favourite words in the Mail's lexicon and you couldn't blame the paper if it felt that it, as well as the children, had been betrayed by yesterday's decision. It would surely be asking questions today. Questions like what happened to the government giving the councils the money and support they needed to help these children? Or asking why, if there are resources only to the end of this financial year - which ends in a few weeks - the programme couldn't resume in April? Remember we're talking about five children per constituency - or about 32 per council with social services responsibilities. Remember, too, that only last month the Mail published another full-page leader. This time about the importance to a democracy of a free press that was able to call those in power to account. So it did that today? No. It gave the story 318 words at the foot of page 6. Rather more space (albeit further back) was found for a double-page hatchet job on Gary Lineker, who not only dared to speak up for the refugees on Twitter when their ages were being called into question, but also had the temerity to upstage Theresa May by being accorded a Saturday Profile in the New York Times on the day it virtually ignored the Prime Minister's "historic" meeting with Donald Trump. Ironically, the Lineker tweets that so enraged the Mail – and The Sun before it – called for compassion for the very refugees whose arrival was the result of the Mail’s “victory for compassion”. But this was the wrong sort of compassion. 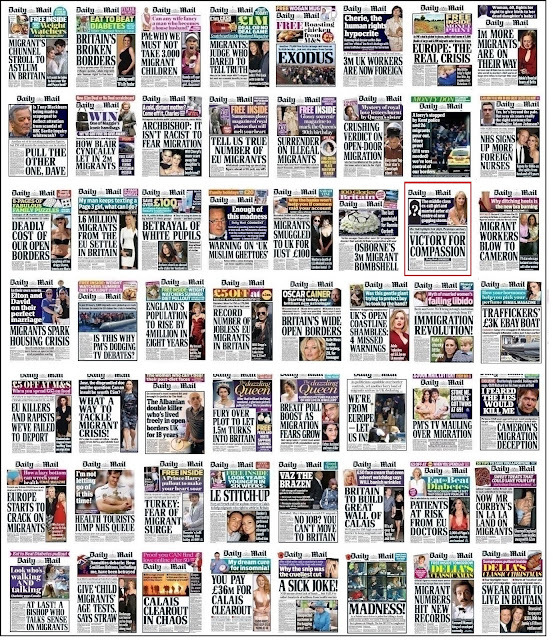 It wasn’t Paul Dacre-endorsed compassion; it was Jeremy Corbyn and Ed Miliband-endorsed compassion. 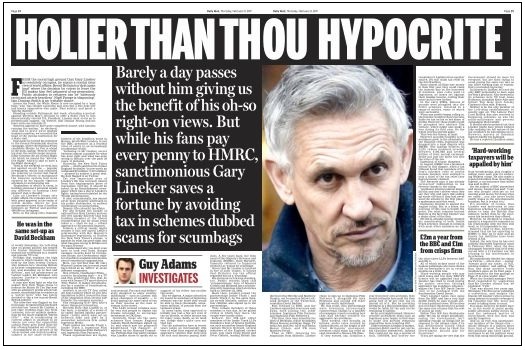 Lineker’s punishment was a quick trawl through Companies House that showed he had invested in a perfectly legal tax avoidance vehicle (which had been previously reported elsewhere) followed by 2,600 words of bile and speculation that included one rather galling fact: that he has 5.5 million Twitter followers, rather more than the Daily Mail has readers. The politicos and their news bunny friends have moved on. In the summer there are boats full of refugees capsizing in the Mediterranean, most people are moved by their plight. But this is winter. The boats aren't putting to sea at the moment. Hospitals are, however, full to bursting and the spotlight is falling on "bed blocking" because the social care system is unable cope with people who are fit to leave hospital but not well enough to look after themselves. And so the refugee children must stay in their "squalid and dangerous camps". 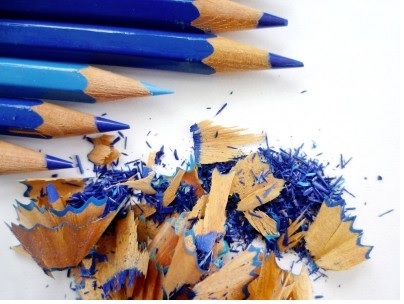 Five per constituency were just too many.